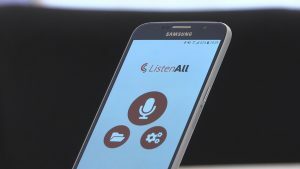 ListenAll allows users with hearing disabilities to follow a conversation, class or conference in real time on their mobile phone or tablet. As part of their commitment to inclusive education, the University of Alicante (UA) and Fundación Vodafone España will dedicate an event to entrepreneurship and research in digital accessibility on Thursday 4 April 2019, in the conference hall of the UA’s Germán Bernácer building. An event which will host the launching of new technologies such as ListenAll, a free application which can recognise people’s voices and transcribe it to text which is especially designed to facilitate the integration of several groups such as people with hearing or motor deficiencies. The app is available for mobile devices with Android and iOS systems. Created and developed by the UA in collaboration with Fundación Vodafone España, ListenAll enables a user with a hearing disability to follow a conversation, class or conference in real time on their mobile phone or tablet, as well as improving the writing speed for people who have trouble writing on devices with touch screens or physical keyboards. Among other innovations this app structures the text it picks up and enables the adjustment of the background colour and font size to improve its readability, as well as its storing, editing and subsequent sending, for example, via email or WhatsApp. All the technology developed for ListenAll is integrated in version 3.0 of Ability Connect, a free communication application for the integration of students with disabilities. Ability Connect makes it possible for several devices to communicate with one another via Bluetooth, without requiring an internet connection, although it can also be used with wifi or mobile data. This app has advanced content visualisation features which are adapted to people with hearing deficiencies, impaired vision or dyslexia. Technological progress in our society is unstoppable, and it is vital to ensure accessibility for everyone, avoiding digital barriers in new digital products, processes and services. In this context, the goal of the “Entrepreneurship and Research in Digital Accessibility” event of the UA is to disseminate the latest progress in this field and show the research and entrepreneurial opportunities that emerge in the process of digital transformation. During the various sessions, which begin on 4 April at 09.30, UA researchers who are responsible for the latest innovations in accessibility will take part. These innovations include Navilens, a marker system which facilitates mobility for blind people, the PAAL projects, focused on lifelogging services which are suitable for older, fragile people, and SIIA, human language technologies for a more inclusive, egalitarian and accessible society; as well as European project ALdia which is committed to research based on innovation and training. Furthermore, pioneering entrepreneurial projects in the field of accessibility will also be showcased such as Timpers, shoes designed for blind people; Trip&Feel, a social company of the touristic sector with accessible and inclusive boats; and AIUDO, a platform for elderly people and vulnerable groups of people. The event is organised by the Vice-rectorate of Students and Employment of the UA through its Digital Accessibility Programme, and Fundación Vodafone España, as part of their collaboration with accessible technologies for the integration of students with disabilities at university.